coming from the sky billions of years ago. Back when the Earth was just forming, the materials that make up the planet were combining and differentiating into layers by weight, lighter materials floated to the surface and now make up Earth’s crust, while heavier materials such as iron sank to the planet’s interior. 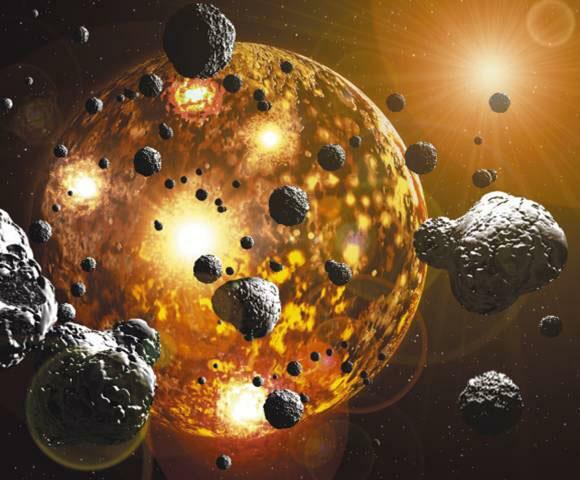 Our understanding of planet formation suggested that precious metals such as gold and tungsten should have moved into Earth’s iron core long ago, due to the affinity they have for bonding with iron. Surprisingly, precious metals instead appear relatively abundant on the planet’s surface and in the underlying mantle layer. Scientists investigated ancient rocks from Isua, Greenland, to see how the planet changed over time and when precious metals entered the picture. Their analysis revealed that the composition of the Earth changed dramatically about 3.9 billion years ago. This violent era was known as the Late Heavy Bombardment, when hordes of asteroids smashed into Earth and the other inner planets , the aftermath of this onslaught is still evident in the many craters that litter the surface of the moon. Those hordes of asteroids brought with them a bevy of precious metals. The scientists posit that these meteor strikes may also have triggered the flow of hot rock in the upper layer of the mantle right below the Earth’s crust that is seen up to the present day.